Damage to helmet, jacket, gloves, other gear, etc. Injuries suffered in a motorcycle accident are usually very serious. It is every rider’s worst nightmare – being hit and thrown from the bike. 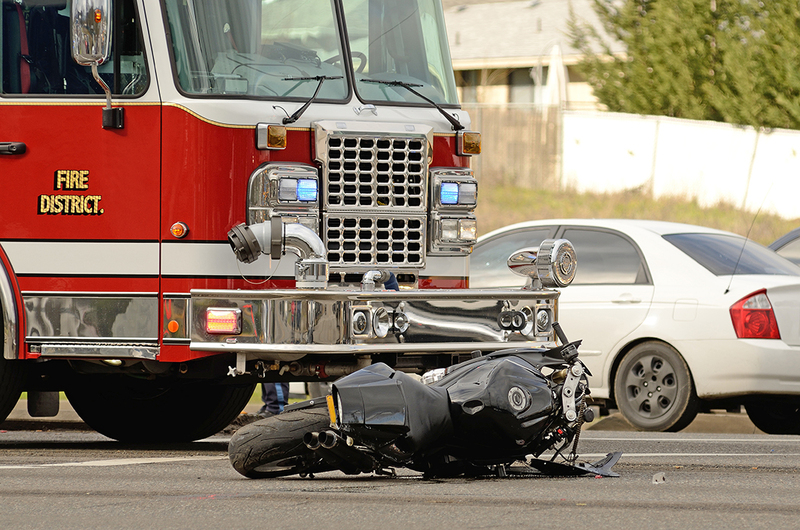 Unfortunately, many inattentive drivers on the road fail to notice that there is a motorcycle rider in the area, and the result can be devastating. In my experience, the most common type of motorcycle collision involves a circumstance where someone is making a left hand turn in front of you, violating your right of way. Also common is a rear-end collision causing the motorcyclist serious injury or death. People just don’t seem to watch out for motorcycles. It also seems folks have a difficult time calculating the closing speed of an approach motorcyclist. While these injuries range in severity, they will all require extra medical attention and probable rehabilitation efforts. You may be unable to work for a period of time and may suffer from emotional trauma as well. Given that most all riders have an “independent spirit” in the first place, it is very common that I see my motorcyclist clients suffer severe depression from being unable to perform the most routine household and personal tasks after being injured in a collision. Let The Outlawyer be there for you during this time! Pick the phone up and CALL ME if you have any questions about your motorcycle accident case or would like to schedule your FREE consultation.